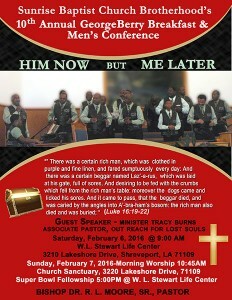 The SBC Brotherhood’s Annual George Berry Breakfast and Men’s Conference will be Saturday, February 6, 2016@ 9:00 AM. Place the W.L. Stewart Life Center. 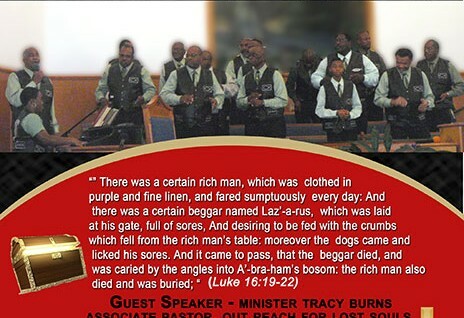 The guest speaker will be Minister Tracy Burns of Outreach for Lost Souls. The conference will climax Sunday, February 7 with Morning Worship at 10:45 a.m. and the Super Bowl Fellowship at 5:00 p.m. at the W. L. Stewart live Center.